COLUMBUS, Ohio – Over 13 people died a day on average in Ohio due to drug overdoses last year, a new high as the state battles the opioid epidemic. Gov. John Kasich, who will leave office in January, played defense during a Thursday afternoon news conference where the death tally was announced, emphasizing the work he’s accomplished to make some progress in the battle against the drugs – such as heroin and prescription opioid-related overdose deaths decreasing. However, the overall death rate is up because people are overdosing and dying due to fentanyl and Carfentanil being mixed into cocaine and methamphetamine. Democrats have been hitting hard during the election season the theme that Ohio’s overdose death rate — which continues to climb and is among the highest in the nation – is the result of weak GOP leadership. Overdose deaths have risen in recent years. Kasich said the state is spending around $1 billion to fight the drug problem, including $600 million on treatment. In 2014, Kasich expanded Medicaid, which covers many people in treatment. Prescription-related opioid overdose deaths have reached an eight-year low. Deaths from heroin are at a four-year low, he said. “If it wasn’t for what we’re doing, the numbers would be higher,” he said. 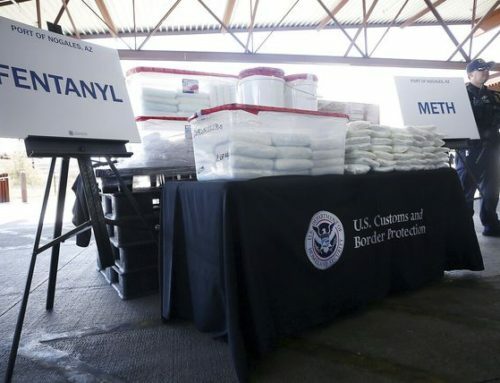 In 2017, 70.7 percent of the drug deaths involved illegal fentanyl and related drugs such as Carfentanil. That’s up compared to 58.2 percent in 2016, 37.9 percent in 2015 and 19.9 percent in 2014. 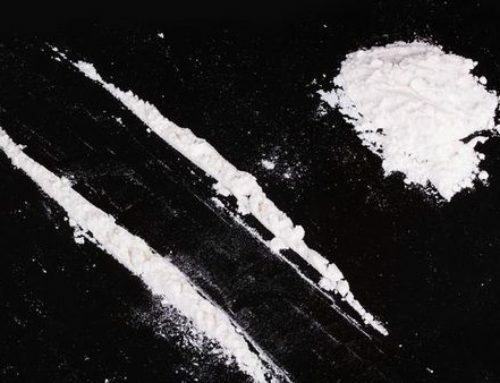 Cocaine deaths accounted for just over 30 percent last year. Meth accounted for just over 10 percent of deaths. That’s an increase for both drugs. But many of those drugs also contained fentanyl and Carfentanil when people overdosed and died. There was a 31.6 percent decrease in heroin deaths last year. In Cuyahoga County 598 people died last year of drug overdoses, up from 547 the year before. In Summit County, 239 people died last year, down from 298 the year before. In Lorain County, 133 people died in 2017, down from 146 in 2016. The number of prescription opioids overdose deaths decreased to 523 people in 2017, from 724 in 2011 – when Kasich took office. Kasich was credited during the news conference for a number of actions in stemming prescriptive opioids overdoses, including adding information to a prescription drug monitoring database. 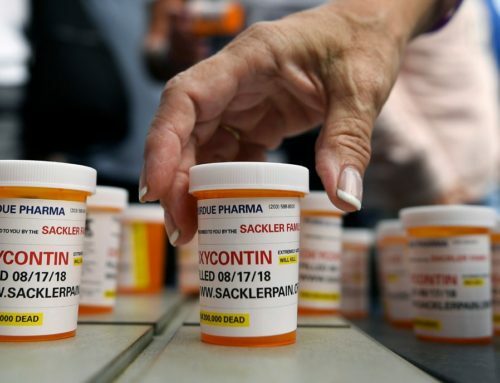 The database has shed light on which doctors and dentists prescribe high number of opioids, which pharmacies dispense the most, and which patients in treatment are seeking higher doses of opioids. 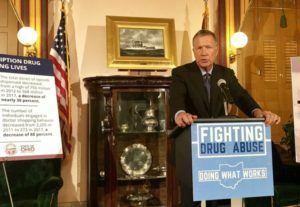 When a reporter asked him if he can do more to stop the drug death rate, Kasich mentioned former First Lady Nancy Reagan and her “Just say no,” anti-drug slogan. “If somebody can tell me how I can keep somebody from the street corner from buying cocaine from a drug dealer, I’m all ears,” he said. He said parents need to tell their children they can’t experiment with street drugs, because they can be so deadly these days with fentanyl and Carfentanil. “I don’t know what else we can do but warn people about these dangers,” he said. On the campaign trail, Democrats are blaming Republicans for not doing more to stem the addiction deaths. Steve Dettelbach, the Democrat running for attorney general, called the opioid epidemic a “tragic symptom” of poor GOP leadership. Richard Cordray, who is running for governor, has talked about the issue since a Sunday Columbus Dispatch report looking at preliminary overdose deaths in 2017. He has also blamed Republicans, in particular his GOP gubernatorial opponent, Ohio Attorney General Mike DeWine. However, a spokesman for DeWine’s office noted the downward trend in 2017 in month-to-month overdose deaths. In January, 484 people died and by December, it decreased to 318. That’s evidence of the hard work of state agencies, including the attorney general’s office, and addiction treatment centers, said Dan Tierney, DeWine’s spokesman. “Additionally, when you look at the work of prescription drug overdose deaths, they’re down 28 percent from 2011,” he said. Cordray was Ohio’s attorney general in 2011.